This movie has a very particular pacing that fans of ’60s-’70s westerns will be aware of. It’s very deliberate and slow. This works for some movies (Outlaw Josey Wales, Fistful of Dollars) but, for me, doesn’t work here. You have a great shootout in the beginning then a long, slow story build until the end. I found myself checking the clock several times wondering if anything was going to happen soon. I was interested whenever Coburn’s Garrett was onscreen, but not as much whenever Kristofferson or Dylan were onscreen. 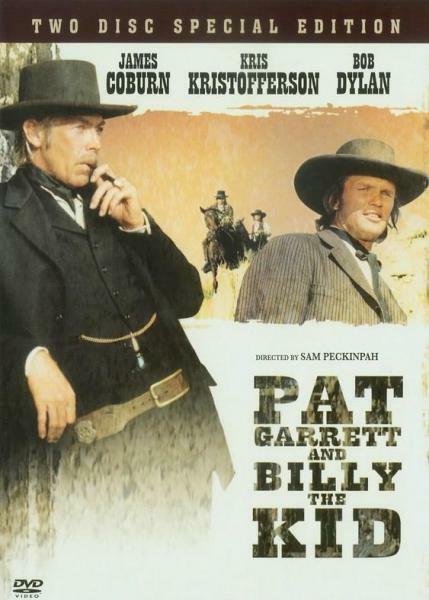 James Coburn is fantastic as Pat Garrett (he’s usually fantastic in everything). He plays the former friend/hunter of Billy the Kid with great nuance and personality. Kris Kristofferson, however, is not as memorable as Billy the Kid. Kristofferson was in his 30s when he played Billy (the same as Newman in Left Handed Gun) but Kristofferson actually looks the part with his baby face more than Newman. I felt he actually resembled the famous tintype picture of Billy the Kid everyone remembers. However his performance of The Kid was a bit boring. I didn’t find him charismatic enough of a personality to keep me interested. Garrett, yes. Billy, no. Maybe that’s how Peckinpah designed this movie to work, I don’t know, but that’s what happened. As for Dylan, well, he’s there. That’s pretty much all I’ll say about that. Something I did find interesting in this movie was how much it was homaged in Young Guns II. I don’t know if it was intentional (but probably was because Coburn is in both movies) but there were several scenes in this movie that looked very similar to Young Guns II. The main scene being when Jason Robards’ Governor Lew Wallace is trying to hire Garrett as the Sheriff to hunt down Billy. The setting and dialogue are all homaged very nicely in Young Guns II. Even the suit Garrett wears after he takes the Sheriff job is similar to what William Peterson as Garrett would wear in the same scenes after being hired as Sheriff. It was a nice touch. Scott Wilson’s Lew Wallace in Young Guns II even looks like Robards’ Wallace here. The shootout at Stinking Springs in the beginning of this movie also looks very similar to the same scene in the middle of Young Guns II. These things were very interesting to pick out and I was probably able to pick them out so easily because I know the Young Guns movies like the back of my hand. And, Young Guns couldn’t have picked a better director to homage. Story aside, this movie is filmed very theatrically. Nice wide panoramas of the New Mexico desert and wonderful location sets make this movie look fantastic. It really does feel like an epic western. I can definitely recommend this as technically this movie is heads and above everything I’ve seen so far, but story-wise, it’s a little weak. For me. I enjoyed watching for the most part to see Coburn really go for it as Garrett, but I was underwhelmed by Kristofferson as the titular Billy. Of course, I may be colored by my love of Emilio Estevez’s over the top portrayal of Billy. 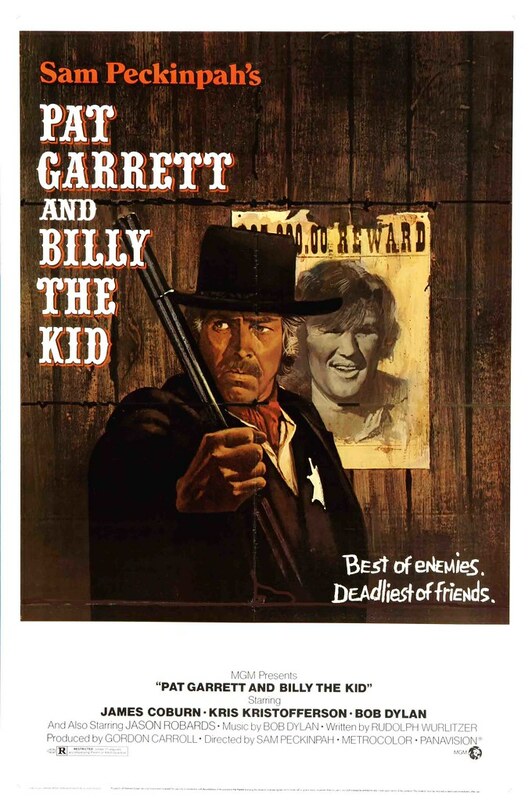 Kristofferson went the exact opposite of Estevez and really plays Billy more understated and quiet (probably closer to the true Billy the Kid). But that really is a personal preference colored by my nostalgia glasses that I look through for Young Guns. This movie gets a recommend, but be aware of the nice and slow ’70s pacing and you’ll be fine. This entry was posted on August 11, 2010 at 8:00 am and is filed under Billy the Kid, movies, nostalgia, pop culture, reviews with tags Billy the Kid, Billy the Kid Week, movies, nostalgia, pop culture, reviews. You can follow any responses to this entry through the RSS 2.0 feed. You can skip to the end and leave a response. Pinging is currently not allowed. Ok, so I applaud you for watching the movie. BUT P.G.& B.K. is by far the best B.K. film EVER! So, here’s why: Peckinpah understood the western, rescued the western, re-created the western. The movie is more like Shakespeare than any “traditional” western. It is the end of an arc before impact: from here it is the debris that is history. This is not an action movie, it is a “tragedy”, it is the “buddy movie” turned on its head, it quite possibly is, within the frame of the image, perfect.